Just have to show you what I have in process. I already showed you what I did for Zoe--the pretty daisy afghan. Well, I wanted to do something for Jack, her big brother, as well. But masculine/teenage boy throw patterns are pretty hard to come by. But my Crochet Along for this year picked a square for June that just hit all the right notes for me. I'm using the brights that I had left over from Zoe's 'ghan, but instead of using black, I'm using sweatshirt grey. The pattern is called Alter Ego, and it can be made in a variety of sizes. Here's where you can find the pattern. 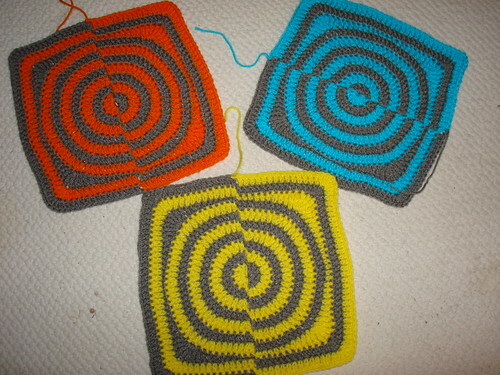 And here are my first 3 squares for Jack's throw. Ends still need to be woven in, but AREN'T THEY AWESOME? Love 'em. And appropriate for teenaged boy. This page contains a single entry by MamaT published on June 8, 2010 12:35 PM. Uber-cool (if you're a booknerd like me it is, really!) was the previous entry in this blog.